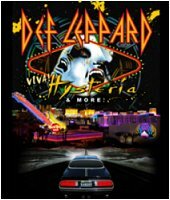 The Def Leppard residency in Las Vegas has been announced today for March 2013 and will be titled VIVA Hysteria! & More. The band will play nine shows starting on Friday 22nd March 2013 at The Joint At Hard Rock Hotel venue. The same venue where Motley Crue and Guns N' Roses have already played their own residencies. As indicated in the press release the Hysteria album will be celebrated by being played in full and in the original running order (Women to Love And Affection). As mentioned previously this means three tracks - Don't Shoot Shotgun, Run Riot and Love And Affection will be played for the first time since 1988. And therefore for the first time with the current band line up. The encore section will be made up of other tracks (quite possibly other non-Hys tracks played in recent setlists). This news follows a few months of news mostly from Vivian Campbell (with a little 'more vague' help from Phil and Rick) which all seemed to suggest a 'Hysteria' show in March. If you cast your minds back to 27th April 2012 and a certain Joe Elliott story from South America - it would now appear this was indeed the first news of this "show". Tickets will go on sale from Friday 16th November. The venue can hold up to 4,000 people but the band are going with the all seater setup making the capacity 2,950. Def Leppard have played the venue twice before in 2003 and 2005 before it's renovation in 2009. The 2003 show is notable for the only playing of 'When Love & Hate Collide' in the USA in it's full electric form. "Tickets go on sale Friday and start at $49.50, with floor seats going for $125. The Joint seats 2,950. "It's small, it's intimate, but it's not tiny like CBGB's, so we can still put on a good show," Elliott says. "The furthest seat from us is 155 feet." "Viva Hysteria! will feature an elaborate set design created only for Def Leppard's Las Vegas residency and will include an encore performance highlighting other classic material from throughout the band's career. Known for legendary big-scale arena shows, Def Leppard will bring their over-the-top production to The Joint offering an up-close-and-personal experience like never before. With the furthest seat only 155 feet from the intimate venue's stage, Viva Hysteria! is unlike any show the band has ever done or will ever do again."